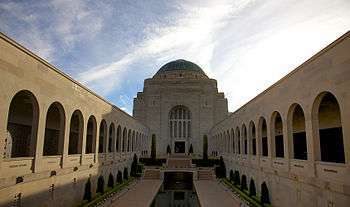 The Australian War Memorial is Australia's national memorial to the members of its armed forces and supporting organisations who have died or participated in wars involving the Commonwealth of Australia. The memorial includes an extensive national military museum. 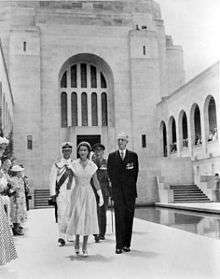 The Australian War Memorial was opened in 1941, and is widely regarded as one of the most significant memorials of its type in the world. In front of the Hall of Memory is a narrow courtyard with a memorial pool surrounding an eternal flame and flanked by sidewalks and shrubbery, including plantings of rosemary for remembrance. Above the courtyard to either side are long cloisters containing the Roll of Honour, a series of bronze plaques naming the 102,185 Australian servicemen and women killed in conflict or on peacekeeping operations. The plaques include names dating back to the British Sudanese Expedition, the Second Boer War, and the Boxer Rebellion. The entire long wall of the west gallery is covered with the names of the 66,000 who died in World War I. The east gallery is covered with the names of those who died in World War II and conflicts since. When the Memorial closes each day, there is the Last Post Ceremony at which visitors can gather at the entrance of the Commemorative Area. This Ceremony involves the reading of the story of one of the 102,815 names on the Roll of Honour. The host welcomes visitors to the Ceremony which starts with the National Anthem and a brief explanation as to the origins of the Memorial and the explanation of the Ceremony that is about to take place. Then a piper and a bugler descend from the Hall of Memory. The piper then plays "Flowers of the Forest" as visitors, family members of the individual being honoured that day or visiting dignitaries lay wreaths of floral tributes at the base of the Pool of Reflection beside a portrait (if available) of the individual being honoured, if there is no photo on record, the image of a tri-folded Australian Flag is displayed in its place . After which a member of the ADF reads out the story, covering where they grew up, what they did prior to enlisting in the ADF, what actions (if any) they participated in during their respective conflict, and invariably the circumstances of their death and burial. Following this the ADF member will ascend to the balcony above the Eternal Flame and recite the Ode. The Piper will then play the "Last Post" At the completion of this the ADF member, the piper and bugler will return to the Hall of Memory and the doors will be closed. The Host then gives a closing address and the memorial officially closes. On the 14th January 2016, the Memorial held its 1,000th Last Post Ceremony where it featured the story of Flight Sergeant Lindsay Arthur Bayley, who was killed on active service with No. 9 Squadron, Royal Air Force, during the Second World War. The Memorial is a two-storey building with a floor plan in the shape of a Byzantine cross. The building is of Byzantine architecture style with strong styling elements of Art Deco throughout. In 2001, a new, broad annex called ANZAC Hall was added to the north of the original building. In order to preserve the view of the original building from Anzac Parade, Anzac Hall was designed to be recessed in the ground, and hidden behind a wall. ANZAC Hall is a large annex to the upper level of the Memorial, used for the display of large military hardware. Notable displays on the west side include a complete and particularly historic Lancaster bomber known as G for George, The wrecks of M-14 and M-21 reconstructed to form a Japanese Ko-hyoteki class midget submarine as both were sunk during the raid on Sydney Harbour in 1942, rare German aircraft such as the Me 262 and Me 163, One of the main guns each from HMAS Sydney and SMS Emden, The east side includes a World War I aircraft exhibition, notably displaying a Royal Aircraft Factory SE5a, Pfalz D.XII and Albatros D.Va, among others These aircraft are accompanied by a movie directed by Peter Jackson titled "Over the Front" highlighting the formation of the Australian Flying Corps. Each of the large permanent exhibits are accompanied by an audio-visual experience. they are from West to East. Mephisto, the sole surviving German WW1 Tank is currently on display in ANZAC Hall while on temporary loan from the Queensland Museum. The building is large and the collections are extensive; a full day will suffice for only the most cursory examination of its contents, the conservative estimate is a minimum of three days is required to see every single item on display gallery item to gain any recollection. A gift shop and two coffee shops are on site, one overlooking ANZAC Hall, named "The Landing Place", and the other on the east side of the main building, named "Poppies Cafe". The sculpture garden on the west lawn of the Memorial contains a variety of outdoor monuments. The sidewalk through the garden is embedded with bronze plaques commemorating various branches of service, specific units and historical events. There is also a number of sculptures, including a gigantic figure of a World War II-era Australian soldier that was originally located in the Hall of Memory, before the Tomb of the Unknown Soldier was placed there. There is a gun turret and Bridge from HMAS Brisbane, a gun barrel from the heavy cruiser HMAS Australia and the barrel from the Amiens Gun – a huge railroad gun captured from the Germans during World War I. Only 5 percent of the Memorial's collection is displayed at any time, with the remainder being stored at the Treloar Technology Centre in the industrial suburb of Mitchell. The facility also includes workshops that are used for restoration tasks. The Treloar Technology Centre is occasionally opened to the public for "Big Things in Store" open days. The memorial also previously published a journal titled The Journal of the Australian War Memorial. In October 2003, after publishing 39 issues, the journal went into hiatus, although a fortieth and final issue was published in January 2007. 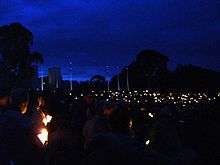 ↑ "Anzac Parade". National Capital Authority. Archived from the original on 19 July 2008. Retrieved 3 September 2015. ↑ "Origins of the Australian War Memorial". Australian War Memorial. Retrieved 3 September 2015. 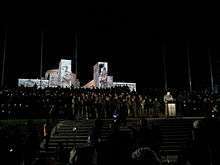 ↑ "Tomb of the Unknown Australian Soldier". Australian War Memorial. Retrieved 28 September 2014. ↑ "Remembrance Driveway". New South Wales Government. Roads and Traffic Authority. Retrieved 2011-08-28. ↑ "Commemoration". Australian War Memorial. Retrieved 17 August 2010. ↑ "Victoria Cross". Encyclopedia. Australian War Memorial. Retrieved 3 September 2015. ↑ Fantin, Elise (18 June 2016). "Australian War Memorial overhauls donation process". ABC News. Retrieved 18 June 2016. ↑ Ellery, David (17 September 2012). "Thousands flock to see AWM's hidden gems". The Canberra Times. Retrieved 3 September 2015. ↑ "Publications". Australian War Memorial. Retrieved 3 September 2015. ↑ "Wartime magazine". Australian War Memorial. Retrieved 3 September 2015. ↑ "Wartime Issue 1: November 1997". Australian War Memorial. Retrieved 3 September 2015. ↑ "Journal of the Australian War Memorial". Australian War Memorial. Retrieved 3 September 2015.